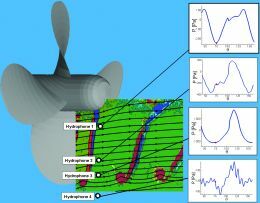 The recent boom in the design and production of increasingly faster boats has rendered especially critical the problems connected with hydrodynamic performance of hull and appendices, with hydro-acoustical and structural interaction between hull and propulsion system and, in general, with comfort on board. The growing need to maximise performance has oriented research towards application and development of methodologies capable of supplying, rapidly and at low cost, responses and suggestions with a high level of accuracy. 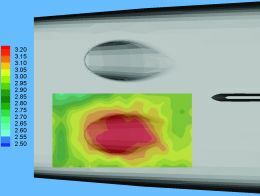 In this scenario, recourse to experimentation is a strategic instrument whose contribution is particularly determining in the targeted study of problems deriving from hydrodynamic interaction of the hull with appendices, manoeuvrability systems and propulsor. 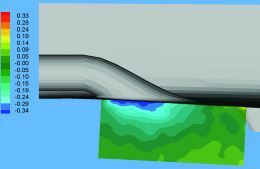 Development, especially in recent years, of laser anemometry has resulted in overcoming the considerable limitations of intrusive techniques, extending measurement even to complex flows in which the introduction of a probe, where possible, can trigger a significant perturbation in the fluid-dynamic field. 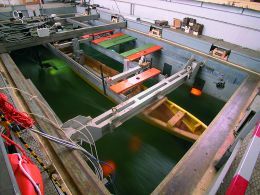 In the panorama of laser anemometric techniques, measuring systems based on image analysis (Particle Image Velocimetry or PIV) are slowly spreading into the practices of the main naval research centres, since they offer not only high accuracy but also the possibility of considerably reducing experimentation costs. 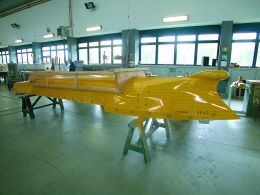 In this field the National Institute for Naval Architecture Studies and Experimentation (INSEAN) has an important role and is a world leader in the application of this technique on a large scale. The basic concept of PIV anemometry is simple. Let's suppose we're standing on a bridge and want to know the speed of the water running beneath us. We can take a piece of paper, set it in the water and subsequently record its position at two predetermined moments, for example by means of a camera set on a suitable support. Having developed the two photos, and having identified in each the position of the piece of paper, we may now determine the distance it moved in the interval of time in question, and hence its speed. In the case of irregular flow we might think of using several pieces of paper thrown in at different positions and then proceeding in a manner analogous to what is described above. What we obtain is a series of shifts &Delata;s(x,y) in the focused fluid area (plane x y) which, divided by time interval Δt between the two photographs, produces the distribution of the field of velocity. The functioning principle of PIV is analogous to what is described in the previous example: measure the distribution of speed in a flat region of the fluid (corresponding to the focused area) illuminated by a suitable light source, setting out from reconstruction of the shifting of inseminator particles between two appropriately defined moments in time. The example described supplies a springboard for emphasising certain peculiar features of PIV. Contrary to what occurs in hot-film anemometry and with Pitot tube, measurement is carried out in the fluid region in question, therefore in a non-intrusive manner. Reconstruction of the field of velocity is obtained starting with the projection of the shifting of the tracing particles along the image surface, so it is intrinsically a two-dimensional datum. In other words, going back to the earlier example, if the course of water to be measured had waves and the camera were set at a certain distance, perpendicular to the free surface, no information would be obtained with regard to the movement of the piece of paper on the vertical (figure 2). 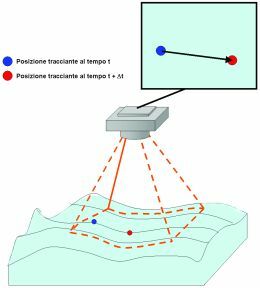 For information on the speed component outside the plane of the image we need to use Stereoscopic PIV, reconstructing the field of movement in three directions, setting out from simultaneous observation of the measurement area from two different perspectives. Lastly, measurement is not carried out directly but through analysis of the movements of particles of inseminator dispersed in the flow. 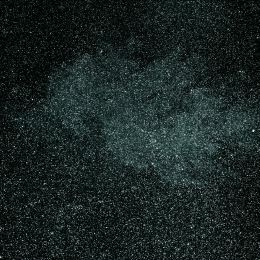 So a PIV measurement cannot do without tracing particles. The insemination process in particular is an extremely critical phase in the measurement chain in which one must take account not only of the fluidomechanical characteristics of the particles in relation to the fluid to be measured but also their concentration. Measurement precision is in fact noticeably conditioned by the need to use tracing particles whose characteristics are such as to faithfully follow the flow and hence to render negligible any velocity lag with regard to the surrounding fluid. 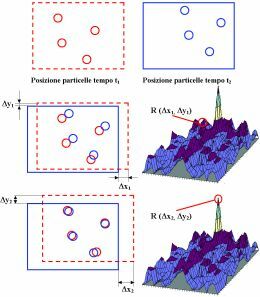 Moreover, in the insemination phase it is necessary to ensure homogeneous distribution of particles whose concentration must be regulated in function of the minimum dimension of the flow structures to be resolved. Figure 3 shows a schematic representation of the experimental set up of a PIV system. In particular, the measurement chain consists of a suitable light source, a system of optics, a system of image recording, a synchronisation unit and of course an insemination system. 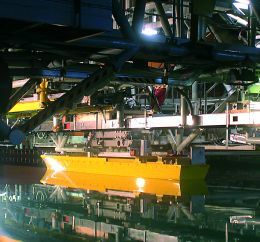 In PIV applications the purpose of the light source is to supply a sheet of very intense and collimated light of brief duration , repeatable at short intervals . Most lighting systems for PIV apparatus consist of two double cavity lasers suitably coupled to emit the first flash on switching on the first cavity flash-lamp and the second on that of the second cavity. This solution turns out to be extremely advantageous inasmuch as it permits defining, with great flexibility, the time interval between the two lightings (which otherwise cannot be modulated since determined by the laser repetition frequency ). 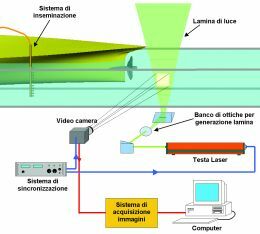 Emerging from the laser tube the beam is directed towards a bank of optics consisting of one or more cylindrical lenses (for generation of the sheet and adjustment of the divergence angle) and, where required, spherical lenses (for adjustment of sheet thickness). The operation of image acquisition is handled by means of digital cameras or video cameras. For many years the use of photographic equipment was the only way of obtaining high quality images, but there were numerous limitations regarding the number of images that could be recorded, the long development time and the possibility of carrying our cross-correlation analyses only on very slow flows due to the limited advancement speed of the film. Over the last ten years the use of "progressive scan" digital video cameras has supplied a valid alternative to photographic backup. Though resolution is less than on photographic film, the use of digital video cameras has introduced numerous advantages including the possibility of having the images available immediately and to acquire images at frequencies that may reach tens of thousands of Hz (CMOS sensors). A PIV image is as shown in figure 4. 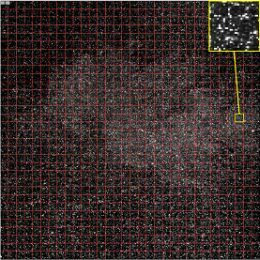 Unlike the description in the example where the position of a piece of paper can be clearly identified in both instants, with a PIV image the concentration of tracing particles is very high so it is not possible to identify trace pairs without ambiguity. 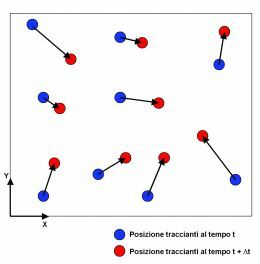 Determination of the movements is therefore carried out with a statistical-type approach, based on the use of the cross correlation function. The idea is to subdivide the two images into a grid of "interrogation areas" (red grid in figure 4) sufficiently small that is plausible to assume a uniform velocity within them. In other words, the overall grouping of traces in the same area is treated like a single particle that moves with a velocity equal to the average speed of the particles contained therein. The cross correlation function, then, is none other than a statistical instrument that supplies information on the dependence of the value on a random variable f1(x1 ,y1) at a point with regard to the value of another variable f2(x2 ,y2) at another point (in our case f1 and f1 constitute the distribution of levels of grey in the first and second image). An example to clarify the functioning mechanism of the cross-correlation function is illustrated in figure 5. Each interrogation area of the first image is transferred to the second along directions x and y, and the function value for each position is determined. What emerges is a distribution as shown in figure 5 where in correspondence to the peak there is the statistically maximum dependence between the position occupied by the particles of an interrogation area in the first and in the second image. This value therefore represents the average movement of the particles of an interrogation window. Extending this procedure to all the sub-dominions of interrogation we obtain the distribution of movements in the measurement area between moments t1 and t2, and therefore the instantaneous field of velocity. In conclusion, PIV anemometry today is a reliable and mature technology whose use is widespread in numerous fields of industrial fluid dynamics. In the naval engineering sector, the optimal compromise in the costs/benefit ratio and the high added value supplied by the use of accurate velocimetric measurements opens the way towards an extensive spreading of this technique with many possible applications in both design and diagnostic phases (see figures 6 and 7).